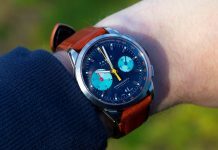 Farer have finally released a trio of mechanical chronographs and, as we’ve come to expect, they’re a little unexpected. Dubbed the Eldridge, Cobb and Segrave, they’re well-made sports chronographs well-endowed with Farer’s signature twists. Colour. Colour’s not something we see enough on in the watch world. It wasn’t that long ago that blue was the ground-breaking trend of the year. Blue. 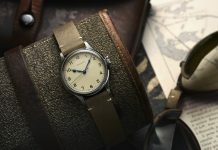 Well done watches, well done. Farer though have a love of colour that sets them above and beyond, despite their watches being what many might call underpriced. Their new chronographs are the perfect example of that. The Cobb isn’t just blue; it uses 6 or 7 different shades across the main dial and cool, asymmetrical subdials with their gradients of aqua. Orange numerals on the chapter ring, a red second hand and a yellow chronograph seconds add a flash more colour. The result is an intensely playful watch that doesn’t take itself too seriously. Yet it’s fun without being cheap; it’s no disposable Swatch, it just dares to have a bit of personality. The same can be said of Farer’s other new chronographs as well. The Eldridge is slightly more nuanced than the Cobb but is no less playful. Rather than more blues than Dougal and the Blue Cat the silk chocolate dial changes as you move the watch, the copper tones deepening and lightening at different angles. There’s still a little flash of brightness from the light blue hands, but the focus is that intriguing dark brown. Finally, there’s the Segrave, which to all intents and purposes is the halfway house between the two. The matte charcoal dial is a pleasant contrast with the pearl white subdials, a reserve panda combination that’s angled to show of its white lustre. It’s complete with a mix of blue, green and orange highlights, not as bright as the Cobb, but more so than the Eldridge. Of course, cool as the three watches are, a chronograph is as much about mechanics as looks. Fortunately, inside each is the ETA Elaboré 2894-2, a mechanical paragon of Swiss precision. The slim movement allows for a shallower profile and therefore more elegant watch. It’s the main reason why, despite these being sports chronographs, there’s something wonderfully classical about them. The rest of that reason is the sheer level of finishing. We’ve already discussed the dials, but the same is true of the case. Drop lugs that hug the wrist, micro-blasted cut-ins on the sides and multiple layers of detail are crowned with Farer’s signature… well, crown. That bronze is matched in the movement’s rotor, visible through the exhibition caseback that lets you see for yourself that Farer have upped their horological game considerably. Whether you’re a fan of the fun, colourful Cobb or prefer the pared-back textural look of the Eldridge, Farer’s new chronographs are exceptionally designed on the outside, exceptionally built within. At £1,675, they’re also exceptionally well-priced. 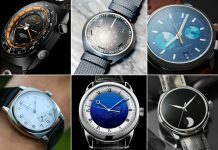 Share the post "Farer’s New Mechanical Chronographs"